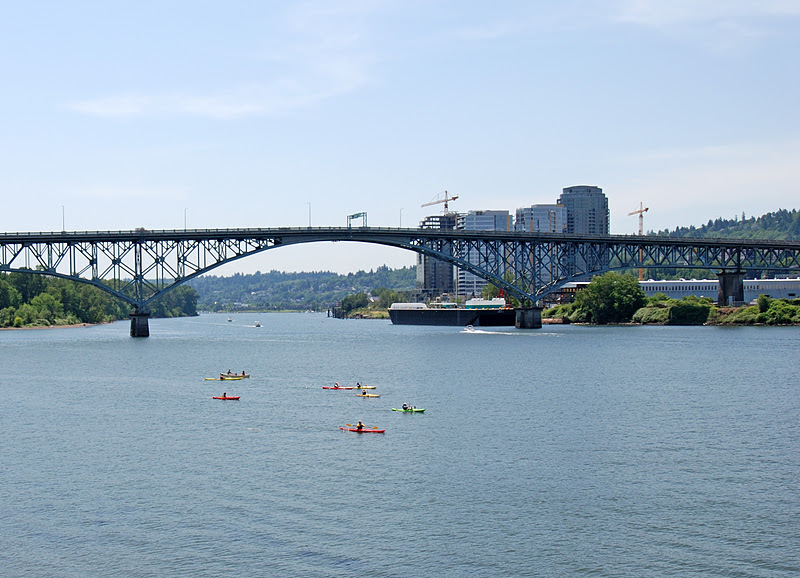 Upstream from the much maligned Marquam Bridge is the more appreciated Ross Island Bridge. Perhaps the public found the Ross Island Bridge more likable because the main truss span is in the shape of an arch. It was designed by Gustav Lindenthal (along with the Burnside and Sellwood Bridges) after a bribery scandal involving the original designers. The 1819 ft long truss bridge was built by Booth and Pomeroy for Multnomah County. They constructed the side spans on falsework and then used cantilever construction to build the main span, which is 535 ft long and rises 123 ft above the Willamette River. The bridge includes 29 reinforced concrete approach spans, for a total length of 3700 ft. The Ross Island Bridge, along with the Burnside and Sellway Bridges, was completed in the mid-1920s, marking the end of a prolific period of bridge building for Multnomah County. Although it's called the Ross Island Bridge, it crosses the Willamette River about 800 ft north of Ross Island. It carries US 26 across the river and connects to a variety of streets and highways in south Portland. This bridge, along with the St Johns Bridge, was given to the Oregon Department of Transportation in the mid-1970s, when the county could no longer afford to maintain it. Portland's Bridges: Ross Island Bridge by Mark Yashinsky is licensed under a Creative Commons Attribution-NonCommercial-ShareAlike 3.0 United States License.